This image could well be the last testimony of addax roaming in the wild. The data collected during fieldtrips carried out between December 2014 and June 2015 point to this conclusion. In June 2015, all of the trees growing on the edge of the Tin Toumma desert and known to shelter addax during the hot season were visited. No addax, recent dung or footprints were found; only old horns and skulls, some showing evidence of knife cuts, dried skin and old dung piles were encountered. The presence of recent vehicle tracks, most likely from poachers, was noted. Our long-term monitoring program points to a serious decline in numbers. In the worst case, the addax may already be functionally extinct in the wild, with at best a few small isolated groups dispersed here and there across this vast desert landscape. In the best case, addax have moved away from their known desert retreats in search of less disturbed areas. For the moment we just do not know. This relatively recent decline in addax sightings can clearly be attributed to increased levels of poaching by both the armed forces and the local community and a massive influx of arms and 4×4 vehicles from Libya. The impacts of massive disturbance to core addax habitat from the oil companies exploiting Niger’s desert-based petroleum resources increase the threat. 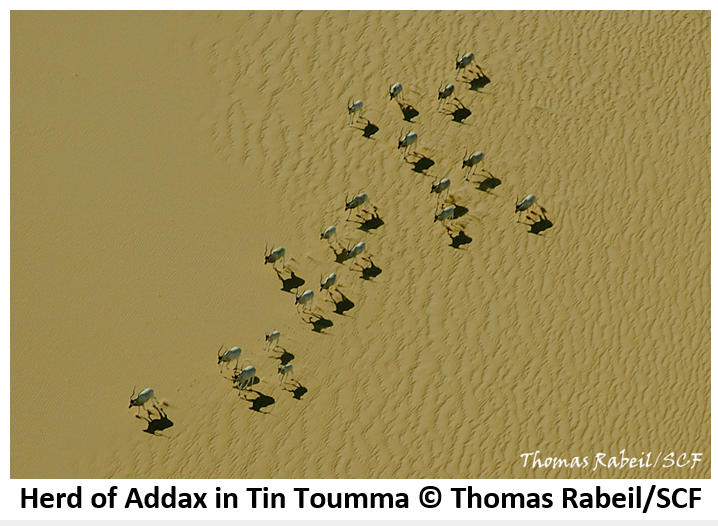 The Sahara Conservation Fund (SCF) is conducting a wide-ranging ground search for signs of addax both inside and outside the Termit & Tin Toumma National Nature Reserve and, depending on the results, carry out a more focused aerial survey to confirm the presence, extent and numbers of the addax population. Over the past few months, reserve staff composed of 20 rangers with two vehicles has been transferred closer to the reserve and a forward base strategically sited within the reserve itself will be established. All conservation work in Niger is hampered by the extremely fragile security situation brought about by terrorism and illegal activities caused by the breakdown of law and order in neighboring countries. Human activities in the reserve, both legal and illegal, have increased tremendously over the past 2-3 years as a result of the meltdown in Libya and the exodus of thousands of people, many carrying arms and arriving with desert-going vehicles. The area is a major crossroads and rear-operating base for all kinds of trafficking by returned local tribesmen. 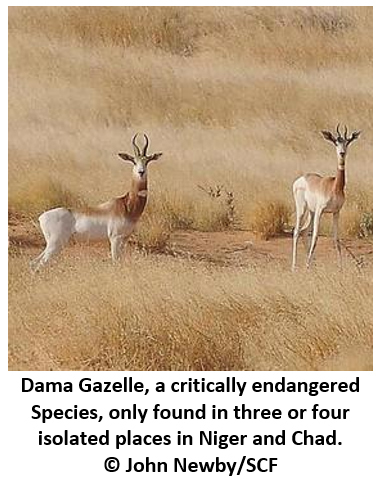 Poaching is the major threat to dama gazelle and addax, but hunters, some from overseas, also threaten aoudad, dorcas gazelle and bustard populations. 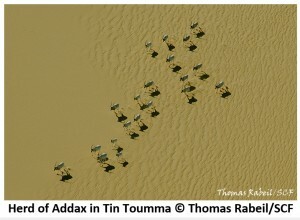 Oil exploration and exploitation in Tin Toumma desert and the great Erg of Bilma and an increase in licensing of new concessions is also responsible for the recent addax population decline. SCF has partnered with the German Aerospace Center, the Zoological Society of London and Würzburg University to detect and monitor man-made structures with the regionally adapted Global Urban Footprint (GUF) layer to monitor the human impact related to oil infrastructure on key addax habitats. The Chinese authorities will be engaged in talks to discuss ways of mitigating disturbance of key addax habitats. SCF is critically aware to work closely with the people who live here and depend on the region’s natural resources. A network of community game guards has been established and excellent relations developed with local leaders. Increased effort will be put into transferring the reserve’s management to the locally elected structures that are increasingly replacing central government. SCF will also assist local people in health care, education and food and water security. The project does what it can to help, including acting as go between and ambassador with mainstream development and humanitarian agencies working in Niger. The addax antelope is one of the rarest and most endangered species on earth. With less than 100 left in the wild, the species’ survival depends on urgent action in the Sahelian nations of Niger and Chad. Addax are red listed as “Critically Endangered” and on Appendix I on both CITES and CMS. The Termit and Tin Toumma regions of eastern Niger are the last remaining strongholds for threatened desert species, like addax, dama gazelle, Barbary sheep and desert cheetah. The addax population found there is the largest remaining on earth. With its partners, SCF has been working for nearly a decade to establish a vast new protected area whose management will benefit both wildlife and local pastoralists through improved habitat use, access to development aid, and the promotion of appropriate ecotourism. On March 6, 2012, Niger formally gazetted the 97,000 km2 Termit & Tin Toumma National Nature Reserve. Straddling the interface between the Sahel and the Sahara, Termit and its environs comprise a wide variety of habitat types, ranging from open sandy ergs and eroded volcanic peaks to stony plateaux and mountain valleys. Annual rainfall is less than 100 mm, although the mountainous relief allows for water to concentrate in the numerous drainage channels and alluvial pans, giving rise to a surprising variety of perennial plants, trees and shrubs. Termit is a veritable sanctuary, harboring over 30 species of mammals, an undetermined number of reptiles, and over 150 species of birds. The Termit massif has recently qualified for an Important Bird Area by Birdlife International.